Apple CEO Tim Cook today apologized to users for the substandard Apple Maps app in iOS 6, and steered them toward alternatives including Microsoft's Bing app and Google's online Maps. 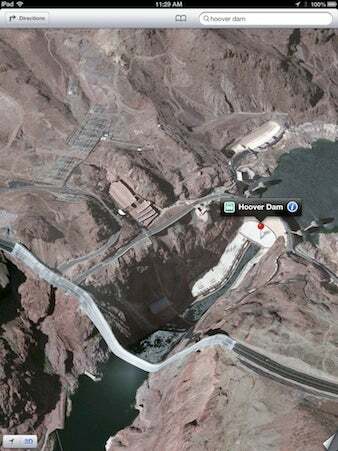 The Hoover Dam bypass bridge south of the dam appears to have melted in this 3D view of the area in Apple's new Maps app. Analysts and other experts applauded Cook's move, although some clapped louder than others. "Cook's letter is timely, significant, and well-executed," said Jonathan Rick, a public relations professional who operates a Washington, D.C.-based digital communications consultancy. In an open letter posted on Apple's website, Cook said the company was "extremely sorry for the frustration" its Maps app has caused customers. The apology came just nine days after Apple released iOS 6, an upgrade that dispensed with Google Maps -- a cornerstone of the operating system since 2007 -- and replaced it with Apple's own mapping and navigational technology. Almost immediately on iOS 6's launch, users began complaining that Apple's new Maps app was subpar. They cited the lack of public transit maps, inaccurate maps, off-kilter points-of-interest, missing streets and addresses, and more. "At Apple, we strive to make world-class products that deliver the best experience possible to our customers," said Cook today. "With the launch of our new Maps last week, we fell short on this commitment. We are extremely sorry for the frustration this has caused our customers and we are doing everything we can to make Maps better." Cook also promised that Apple's Maps app will improve over time, but in the interim, suggested that customers try alternatives. "While we're improving Maps, you can try alternatives by downloading map apps from the App Store like Bing, MapQuest and Waze, or use Google or Nokia maps by going to their websites and creating an icon on your home screen to their web app," he wrote. As Cook said, Bing, MapQuest and Waze can be downloaded from the App Store. All three are free. While some observers cited Cook's apology as evidence of a more humble Apple, mea culpas were not unknown during the regime of former CEO Steve Jobs. In 2007, Jobs tacitly acknowledged Apple had misstepped by cutting prices of the then-new first-generation iPhone after millions had paid higher prices in the months before. In an open letter of his own, Jobs said the company would issue a $100 credit to anyone who bought an iPhone before the price cuts. "We need to do a better job taking care of our early iPhone customers as we aggressively go after new ones with a lower price," Jobs said at the time. "We apologize for disappointing some of you, and we are doing our best to live up to your high expectations of Apple."